When I was planning what protein rich dishes I was going to make, peanut butter was on top of the list. I was planning to make a peanut butter and banana sandwich, but then I came across this delicious pudding recipe. It was also full of chia seeds so one recipe took care of both the protein rich ingredients peanut butter and chia seeds. What I really like about this pudding is that one can even have on days that you are fasting. I know many people fast all 9 days of Navratri without consuming grains, pulses, salt and vegetables. So here’s just the right kind of pudding to energize you and make you feel full too. Just replace the normal salt with rock salt or omit it. One should be a bit careful about the quality of peanut butter we buy. Many of them have transfat added to them to make the whole process of processing the nuts faster, also adds to the weight and of course its cheaper. Most low quality peanut butters become rock solid when stored in the fridge. I had bought a jar of peanut butter from the organic section at a supermarket in Montreal and though I left the jar in the fridge, it was still spoonable, soft and not rock hard. Making peanut butter at home is not difficult at all. All you need is a strong food processor. Add the roasted and shelled peanuts into the processor. Add a bit of salt and if you like a tbsp or so of oil. Process till you get a coarse mixture. At this point your can remove some if you like it crunchy. Process the remaining peanuts till it becomes smooth. Mix in the coarse paste you had removed, mix and your peanut butter is ready. Peanut butter is a healthy and nutritious alternate for dairy butter for both kids and adults. Rich in protein and healthy fats, its good for the heart, regulates Type 2 Diabetes, good for digestion as is high in fiber, prevents gallstones, a small amount of peanut butter makes you feel full. Its an energy booster, good for the brains ( rich in antioxidants). However too much of it will add more calories, so like everything else eat it in moderation. The other wonder food in this pudding is chia seeds. Chia means life. These little white and black seeds are full of fiber, protein, omega 3 fatty acids, carbohydrates, calcium and antioxidants.Chia seeds can be added to your smoothies, desserts, bakes, oats, cereals, energy bars, yogurt, sauces etc. Chia seeds also makes one feel full. Ever since hubby and I’ve come back from Montreal, our meal times especially at night has changed completely. By 5 in the evening we feel hungry so we snack on something with tea. Then we’re not hungry at dinner time. However later at night we tend to feel a bit peckish. So nowadays I try and make a healthy snack and for the peckish times, eat some fruit. After this pudding was set, I just couldn’t resist and wanted to try it. I had it at around 6 in the evening and just didn’t feel hungry or peckish after that. I wouldn’t mind having this for breakfast too. Add grapes, juice and maple syrup or honey or sugar to a pan. When the mixture begins to boil, lower the heat and let it simmer till the grapes are cooked and soft. Mash it lightly. Take the pan off the heat. Add chia seeds and orange zest and mix well. Spoon the mixture into 2 serving bowls or glasses. Put it the fridge to chill. Take a tall container and add milk, peanut butter, vanilla extract,salt, maple syrup or which ever sweetener you’re using. Whisk the mixture to blend the milk and peanut butter. The mixture will become a little thick. Slowly pour the mixture on top of the jelly layer. Cover the glasses with cling film. Put the glasses in the fridge for the pudding to set. This will take about 2-3 hours but its best to leave it overnight as it sets well. Just before serving top it up with chopped nuts or chocolate chips. If you prefer you may make a layer with commercial jelly(jello). Use any other fresh fruit of your choice to make the jelly. To make it more appealing for kids add cocoa powder to the peanut butter milk mixture. Adjust the amount sweetener according to your taste. I used maple syrup and it was not too sweet. A great dessert to have during fasting days. Just replace the salt with rock salt. For vegan option use any nut milk. 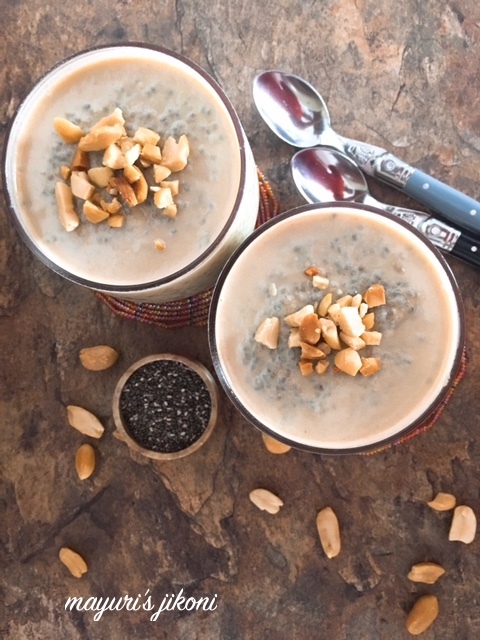 This is one lovely navratri fasting recipes… Happy festival Mayuri 🙂 Peanut butter with chia seeds makes it absolutely delicious!! Wow this surely sounds like a fantastic dessert!..my bookmarks for chai dishes are so going high! What a burst of flavors ! This tiny seed makes you full and is unbelievably healthy , no wonder you were not hungry . Thanks for sharing this wonderful and healthy pudding. I shall try it later in the fasting days. This looks so yum Mayuri. The layers in the pudding have so much flavours packed in them..
Am sure this pudding will definitely please my tastebuds, anything with peanuts goes directly to my favourite dish. Droolworthy pudding. Bookmarking to make in the grapes season. This must be so delicious. I could have it for my lunch. I never knew the meaning of chia… wow its life huh? This is such a great dessert and perfect for this festival season. Great share Mayuri. Delicious dessert recipe. Very healthy.